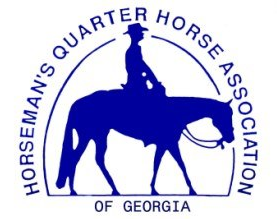 Horseman's Quarter Horse Association of Georgia, Inc. (HQHA) is an organization of horsemen and horsewomen organized to promote interest in breeding and exhibiting the American Quarter Horse. HQHA is headquartered in Central Georgia and is incorporated under the laws of the State of Georgia as a non-profit association. All shows shall be under the sanction of the American Quarter Horse Association and conducted according to their rules and regulations. At our registered Quarter Horse Shows, we offer Open, Amateur, Novice Amateur, Select Amateur, Youth, Novice Youth and Small Fry Divisions. Classes offered are halter, showmanship, hunter under saddle, hunt seat equitation, hunter hack, western pleasure, western horsemanship, trail, reining, western riding, barrel racing, and pole bending. Members ride for year-end high point awards, ride in team tournaments, and represent us on NYATT Congress Teams. Come join us! Visit our Calendar of Events to find when and where. HQHA hosts exhibitors' parties, ice cream socials, and will keep you supplied with coffee and donuts. All HQHA sponsored shows are held at the Georgia National Fairgrounds and Agricenter in Perry, Georgia, either in the heated/air-conditioned Sutherland Livestock & Equine Arena or the Reeves Arena. Once again all Horseman's Quarter Horse Association Shows offer "Tim Kimura" trail patterns. You do not have to be a HQHA member to show with us, but we would love to have you join our association. See you on the rail!